The oft-told story behind the origin of the Hulu-Hoop is the tale of two childhood buddies named Richard Knerr and Arthur “Spud” Melin, the founders of Wham-O, who first heard of kids gyrating hoops around theirs waists for fun when a visiting Australian mentioned its popularity back home. 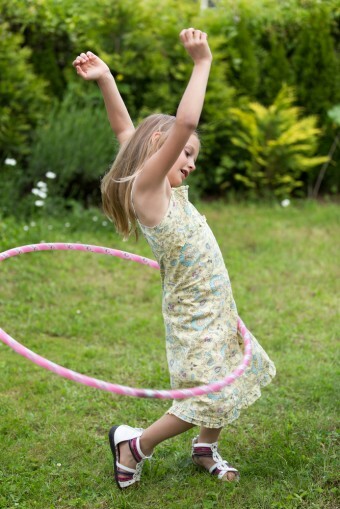 Knerr and Melin began making their own hoops out of polyethylene (the Aussies used bamboo,) and dubbed them “Hula-Hoops” after the hip-swaying Hawaiian dance. The product enjoyed brisk sales initially – 100 million sold within the first year. But interest in the Hula-Hoop waned quickly until the mid-1960s, when Wham-O added ball bearings inside the plastic tube (which meant you could hear that stitch in your side developing), launching a Hula-Hoop revival that lasted over 15 years. The product was selling as fast as Wham-O could make them (sometimes 20,000 a day), and Arthur K. Melin patented the Hula-Hoop on this day in history, 1963. Great story, but Melin had a problem right off the bat on the patent part. “Hooping” as a form as entertainment had been around forever. There is proof that ancient Egyptian kids rolled up dried grapevines to use as hoop toys. There are depictions on pottery found in Greece from thousands of years ago showing folks getting their hoop on. From Europe to the Americas down through the centuries – there is ample evidence that hooping as an activity existed long before Melin, Knerr or Wham-O. Melin argued that Wham-O’s Hula-Hoop was constructed from material that had never been used before to make hoops, but it was pointed out that, under the Rose is a Rose by Any Other Name Rule, merely constructing an item with a different material isn’t enough to meet the originality requirement needed to obtain a patent. Wham-O didn’t walk away empty handed though. The company was allowed to trademark the name “Hula-Hoop” in the United States, and they’ve made a tidy profit from a toy that has been around since the time of the pharaohs – if not longer. A Hula-Hoop in 1958 would set you back $1.98. That would be about $15.51 today.